Aces and Faces is a version of Jacks or Better video poker with a few kinks and twists when it comes to winning hands and payouts – namely, certain combinations using Aces and face cards (Jack, Queen and King) pay better than lower-ranked sequences. These alterations may be slight, but nevertheless they affect both the house edge and the ideal strategy. Discover how to play Aces & Faces online. Aces and Faces is based on Jacks or Better poker, which uses a standard deck of 52 cards and the basic elements of five card draw. The machine deals us five virtual cards at random, and we must decide which ones we wish to keep (hold) and discard the rest to be replaced by new ones (draw). The idea is to create the strongest traditional poker hand; however, rather than comparing our cards against other players, we win or lose based on a set list of winning hands which each come with an individual payout. To learn about generic video poker rules and run of play, read our dedicated article here. As in regular Jacks or Better, the lowest paying hand in Aces and Faces is a pair of Jacks, Queens, Kings, or Aces – any single pair ranked 10 or less is worthless. The first variation comes with the full houses and flushes, which return at 8 for 1 and 5 for 1 respectively in most Web adaptations – that is, less than the 9/6 arrangement in full pay Jacks or Better. But this shortfall is made up for when we reach the four of a kinds, which offer better payouts for higher-ranked cards (i.e. the Aces and the faces). As shown in the chart below, a four of a kind in pictures wins more than its equivalents ranked 10 to Deuce, while four Aces pays second only to a royal flush. Significantly, the royal flush pays more in Aces and Faces across the board. Notice how the top prize jumps up by increments of 1,000 from the three-coin bet onwards; this means we get a bonus on the royal flush whether we bet three, four, or five coins per hand, whereas most Web video poker titles only grant us that boon for the maximum five-coin wager. Using optimal strategy, 8/5 Aces and Faces produces a theoretical return of 99.3 per cent. This leaves a house edge of about 0.7 per cent, making it a slightly riskier game than full pay Jacks or Better (house edge 0.5 per cent). But how can the house edge be higher in Aces and Faces when there are more big payouts on offer, you may ask? It all comes down to probability. Even though the returns for royal flushes and four Aces are very alluring, our chances of hitting these hands are extremely low – 0.003 per cent in the case of a royal flush. Meanwhile, two hands that make up a much larger portion of a player’s long-term returns – the full house and the flush – pay less than they do in 9/6 Jacks or Better, so this diminishes our likelihood of beating the casino in the long run. Below is a simple strategy for Aces and Faces. Determine which of these combinations you have in your hand, then go with the highest ranked option. 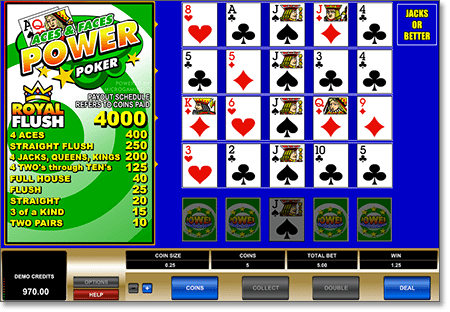 Microgaming AUD casinos such as Royal Vegas, All Slots Casino and Platinum Play offer a multi-hand video poker game called Aces and Faces Power Poker. Here, we can play four hands at once and maximise our chances of hitting the jackpot. We start with what is known as a ‘decision hand’, which has no money riding on it, where we get five cards and decide which to hold and which to replace. The cards we choose to keep will then appear in our four active hands. When we click to draw, each hand will be dealt from a different standard deck of 52 (minus the held cards). Then just sit back and enjoy winning up to four separate payouts for each hand, with the option to gamble any hits on a double-or-nothing bonus game. The great thing about this format is it is very rare to go two hands in a row without hitting at least one paying hand, which means drought-free Internet gambling and hours of fun for Australian video poker players. For the best Aces and Faces games on the Internet, check out one of our recommended video poker casinos for Australians. Each of our top sites carries hundreds of real money gambling titles, mobile video poker for smartphone and tablet devices, and secure AUD banking protected by 128-bit SSL (Secure Socket Layer) encryptions. They also bear the eCOGRA Seal of Approval, which is only awarded to online casinos that pass rigorous third-party testing to ensure fair, honest online gaming. Royal Vegas – Our number one Aussie gambling website. Play over 500 Microgaming titles including several video poker variants and take advantage of a generous AUD $1,200 sign-up bonus. All Slots – Offers a great instant-play casino for Web pokies and electronic poker alike, with hundreds of games available for free play or real money bets using AUD. Register today for up to AUD $1600 in bonus money. House of Jack – A new Aussie favourite, with hundreds of interactive casino games and top-shelf video poker offerings. New players can claim up to $450 in welcome bonuses plus 100 free spins on the pokies. Play real money Aces & Faces and other video poker variants at Royal Vegas Casino and claim up to $1200 in bonus money.